Six Rallon owners chime in on how they built up their rides and what makes them rad. If you've ever cruised our Bike Check section, the largest collection of badass bike builds on the internet, you know that Vital members spare no expense when it comes to radifying their rides. Always on the hunt for a backstory, we reached out to the owners of these six custom trail crushers to find out what went into each project. From the quietly understated to a Crayola Christmas party, these rowdy rigs all have one thing in common: they were born to charge. What do their owners have to say about them? Launched in 2017, the R5 is the 5th generation of the Rallon, and one that marked a complete departure from the previous versions. Featuring a distinctive asymmetric design which places the shock to one side of the top tube, the carbon-only Rallon R5 rolls on 29-inch wheels and sports 150mm of travel in the rear. The head angle sits at an enduro-friendly 65 degrees while the 75.5 seat tube angle makes sure getting back up the hill is not too much of a chore (numbers in Lower geometry setting). 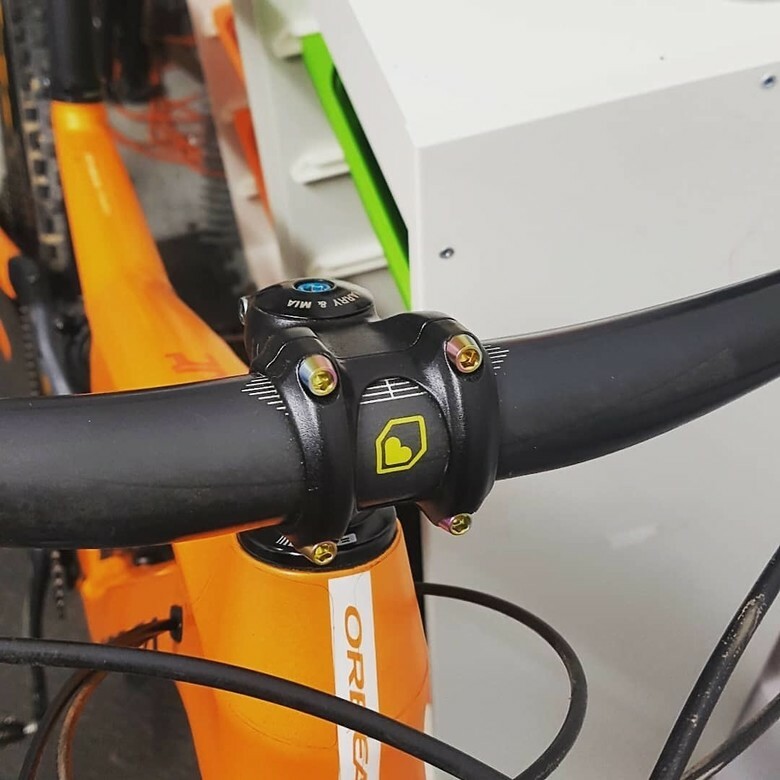 What really sets Orbea apart is the "MyO" program which allows customers to customize not only components but also the frame colors. View the Orbea Rallon in our Product Guide. Where do you live? Inverness, Scotland. Favorite local trail to ride? The Mast, Inverness. Why did you pick the Orbea Rallon? I think because of the custom program and the geometry is spot on for my racing. Is this Orbea Rallon your only bike? Yes it is the bike the team races with but is used all year round. What bike did this replace / What bike were you on before this? Santa Cruz Nomad MK3. Did you use Orbea’s custom frame color option? If so, what was your inspiration for the colors you picked? The shop I race for picked the custom orange and black you see here, looks great! Did you go for an off-the-shelf build or did you customize the build? It was a custom with the upgraded dropper, FOX 36 Factory and Float X2. What’s your favorite part about the bike? It's very easy to ride and is a very surprising climber despite its intentions. It really is a great all rounder. What would you change on it? I would like to drop a few pound off it but I guess the bike's durability might be compromised if I do! How long do you plan on riding this bike? Another season. If you could get another new bike (any kind/type) right now, what would you get? Might go back to 650B for some fun! Favorite local trail to ride? Black Forest, Park City. Why did you pick the Orbea Rallon? This was an easy choice with geometry that spoke stable while still playful. With a 65-65.5 head angle, steeper seat angle, this bike can get rowdy on the down but acts like a mountain goat on the way up. It also doesn’t hurt having a sub-29 lbs XL under me with all that squish. Other than the geometry, I went towards the quality Orbea is known for, with reliable carbon builds and customer service. It should be noted, I have been on the Rallon for a year with the bike featured being a color change and Fox upgrades for me. Is this Orbea Rallon your only bike? I have many bikes but this is my only mountain bike at the moment. Once I got the Orbea, I ended up selling my other three mountain bikes; turns out they were just taking up space and I have been happy with my Orbea alone; an all-in-one powerhouse for my style of riding these days. What bike did this replace / What bike were you on before this? This bike replaced three others as I used to be more of a spandex guy. The Scott Scale and Spark no longer live with me as I donated all my tight spandex to charity. My Evil “Following” and I shared many memories together as it took me to many new unexplored places. However, it was time to ditch the slacker seat angle, head towards a lighter bike, and something that didn’t need to be so over forked to feel balanced. Did you use Orbea’s custom frame color option? If so, what was your inspiration for the colors you picked? I did go custom, this was a simple choice; it costs the same as a stock color. Sure, it may take a little longer, but order in the winter and you receive it with plenty of time before the season hits. The color combo was inspired by everyone who participated in my “Battle for Colors” vote on social media. I would pair two color builds and take it to a vote. After narrowing it down to six color options, we whittled down to three options before crowning the final winner. The victor was a Jade Green and Purple and the overall quality from the factory was perfect. Did you go for an off-the-shelf build or did you customize the build? I started with an off the shelf but did throw in a few upgrades. The build started off as an M-Team with the following upgrades: Fox Float X2 (newer version for 2019), SRAM Code RSC, and a 175mm dropper post. 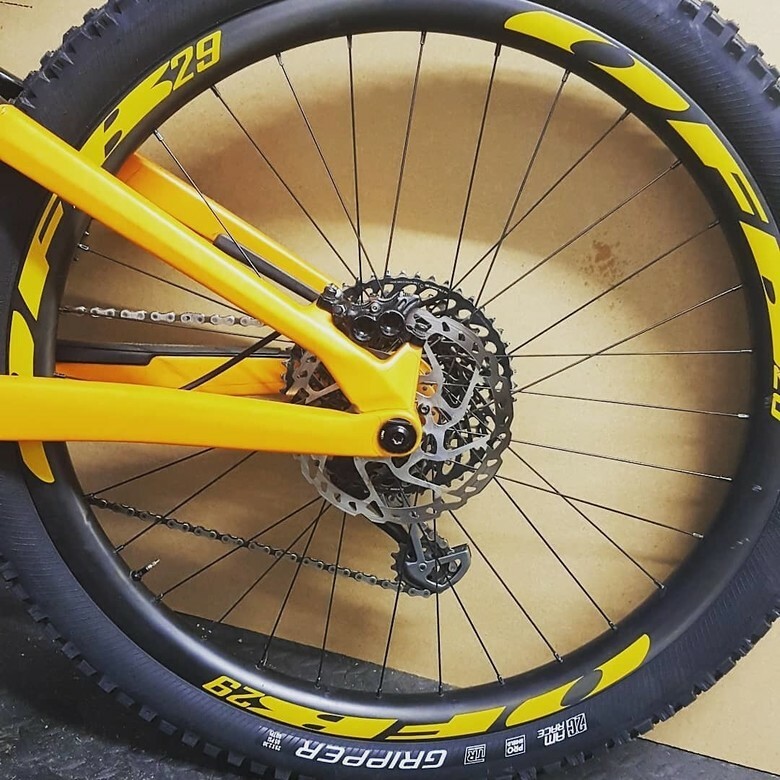 The method of building out your bike has changed a little in the last month and some of the upgrades might be standard now. What’s your favorite part about the bike? The smile that it puts on my face! I can’t help but to get excited to ride my bike as I daydream about our day together playing in the dirt. If some of you are reading this thinking “this guys loves his bike way too much”, you would be correct. The Rallon is a 160/150mm, sub-30 lbs do it all bike that will not put a limit on the trails you want to ride, I love that about this bike. This bike will take me on many adventures. Even as I write this article, I am gazing out of the windows of my apartment in Bhutan, planning my afternoon ride. There is no other bike I would rather have with me as I explore what Bhutan has to offer, steep ups or downs, rocky or smooth single track, all day adventures or shuttle laps; this is my one-bike-quiver-killer. What would you change on it? Some of what I am about to say is already in effect with 2019 models hitting the build site. First, no more 10mm riser bars on the build kits, 2.5 Maxxis Aggressor will be coming stock on the rear not the 2.3, RockShox options?? ?, the new bike comes with a crankbrothers dropper for 2019 but FOX just released their new 175mm (bummer timing) however, I heard the new crankbrothers is performing well. How long do you plan on riding this bike? I will have this bike for 1-2 years. I will be sticking with the brand as some exciting things are in the mix (can’t say anymore). If you could get another new bike (any kind/type) right now, what would you get? I want the new Orbea OIZ for a Park City all day machine. While I don’t mind putting in 75+ mile rides on the Rallon, the OIZ would make it a little more fun with a 130/120mm build out option. I know I might get a lot if crap for this but an E-Bike Rallon would be fun, no it doesn't exist, just playing with the thought. In the Wasatch we have a lot of rough steep moto trails and an E-Rallon would open up a lot of trails without having to hike-a-bike. Where do you live? San Diego, California, USA. Favorite local trail to ride? Palm Canyon Epic. Why did you pick the Orbea Rallon? It’s a unique bike brand and the frame characteristics are just as unique. The ride quality both while pedaling and descending is incredibly well balanced while still being excellent at both UP and DOWN. Did I mention a lifetime warranty? Is this Orbea Rallon your only bike? No, I also have a 1993 Specialized Stumpjumper [King hubs, King headset, and I added a set of the original SweetWings cranks with ActionTec titanium rings] and a custom titanium gravel/road bike from T-Lab (Montreal) that I love to get the longer rides in on…that one is just as unique as the Rallon! The Stumpy was recently revived after hanging in my father in law’s garage for over 15+ years. What bike did this replace / What bike were you on before this? Replaced a 2017 Orbea Occam TR that I built around the now current “aggressive XC/light trail” category. Wide bars, FOX 34 set to 120 (for more stiffness), 30mm internal carbon rims, and 2.35” tires. Did you use Orbea’s custom frame color option? If so, what was your inspiration for the colors you picked? Yes, the MyO program is the same price as a stock color so WHY NOT? Just takes a little more time…but when you strive to make unique builds…it was a no-brainer. I wanted to build something around the lack of color…I called it Project #absoluteBLACKMonochrome on Instagram. With the new XTR being sort of grey/black and the new eeWings from CaneCreek being titanium I wanted something to match well and stand out due to lack of color WITHOUT being just a murdered out “stealth” build. Did you go for an off-the-shelf build or did you customize the build? It started as a stock M-Team build as I wanted the suspension parts but I took everything off it and swapped in what I wanted. The rest of the parts are available with exception of the prototype White Industries CLD+ freehub body. Shimano XTR 12 speed uses a new MicroSpline freehub, which only a few companies have released products for. I was fortunate to have a good relationship with them to make it happen and they are the ROLEX of hubs…you will know what I mean when you see or own your own set! The BERD Polylight spokes are UNIQUE as they are basically strings with a bunch of science thrown at them and paired with the custom Enve M730 29 rims…the white spokes stand out. What’s your favorite part about the bike? Hands down that would be the crankset and special edition absoluteBLACK chainring. The CaneCreek eeWings might seem over the top for most people…but the durability claim will never be beaten by anyone making a carbon crankset in the same weight ranges. SRAM XX1 DUB might be lighter on paper…but add it all up all the small parts (pedal washers, booties, crank skins, preload adjustment collar, etc…) and these titanium beauties are within a few grams! And are rated for ENDURO…unlike the XX1 which aren’t. The ability to run the special edition color matched absoluteBLACK chainring made it even sweeter as the finish played well with the rest of the build too! What would you change on it? I am not very happy with the stock Crankbrothers Highline dropper post…it works, but it’s pretty slow. So working on a BikeYoke Revive next and cleaning up the seatclamp with a BikeYoke Squeezy clamp and BikeYoke Willy. How long do you plan on riding this bike? I normally put 16-24 months on bikes but this one is out of this world…I will have trouble letting this guy go. 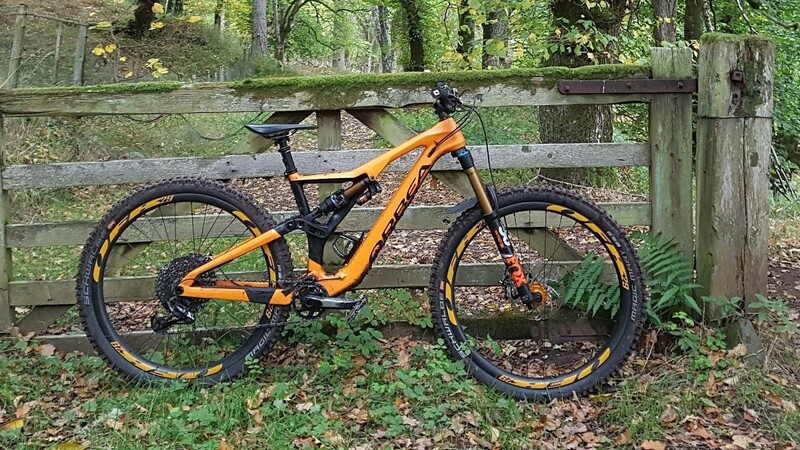 As bikes in this category are getting more and more capable of doing various kind of terrain…they hold their value and usage much more than something that’s on one of the edges of the riding spectrum (Full XC-trail-AM-Enduro-DH). If you could get another new bike (any kind/type) right now, what would you get? I have my heart set on building a custom titanium 29 hardtail…probably 130mm fork and moderately wide rims (something like an Enve M630). I think that’s the one trick pony for a hardtail that still lets you do those silly endurance events (parties) like 24 Hours in the Old Pueblo in Tucson, Arizona or go on that technical and fast shuttle ride! Where do you live? Hong Kong. Favorite local trail to ride? Well...illegal trails are better. Why did you pick the Orbea Rallon? The nice look attracted me first. 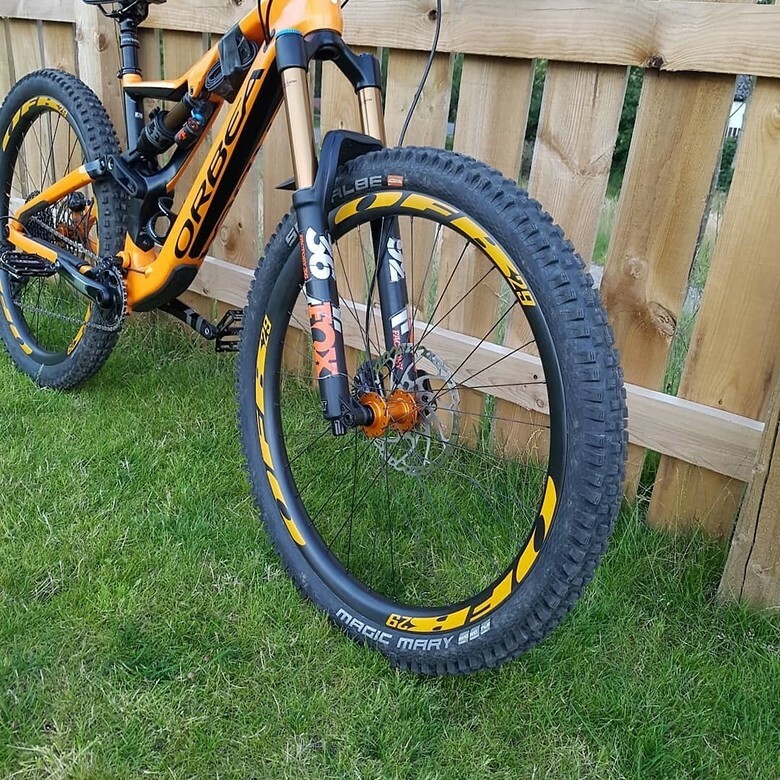 I was looking for a 29” Enduro bike for both enduro and DH racing with long reach. My Orbea with custom colour is just perfect for me. Is this Orbea Rallon your only bike? No, I've got a few road bikes for training, a 26” DH, a dirt jump bike and 2 Focus XC bikes. What bike did this replace / What bike were you on before this? It replaced my Nomad 3 27.5” enduro bike. The Orbea is faster, more stable with the same flexibility as Nomad. Found out that I don’t know how to ride the old bike now, too small! Did you use Orbea’s custom frame color option? If so, what was your inspiration for the colors you picked? Sure, it’s easier to find my bike with custom colour while racing. The blue and red reminds me of the British flag. It’s how Hong Kong people miss our good old time. Did you go for an off-the-shelf build or did you customize the build? It’s a complete bike. I changed the drivetrain from SRAM to Shimano M8000 and added Cushcore to my wheels. That’s it! What’s your favorite part about the bike? The frame for sure. But I must say the suspension is great too. I didn’t change any settings on it, just little adjustment to the fork and it’s fit to ride! Very stable. What would you change on it? It would be better with longer reach and shorter seat tube. I’m 170cm tall, needed to get L size already. How long do you plan on riding this bike? Maybe 3 years? See what’s new then. If you could get another new bike (any kind/type) right now, what would you get? I would get Orbea Oiz XC bike. Because of the good looking design with long reach and short chainstays. It’s super light also! Where do you live? Bentonville, AR, USA. Why did you pick the Orbea Rallon? I'm on the tallish end of the spectrum, 6'3“, so the seat tube angle and other geometry numbers looked appealing. Once I got a chance to demo one it was a no-brainer. I called the bike "dangerously fast". I was carrying so much more speed through turns and chunder on it that I was having to aggressively brake check for features I'd never had to before on familiar trails. The ability to customize the bike was also a major plus. Is this Orbea Rallon your only bike? No, I have several other bikes. I have a Kona Big Kahuna hardtail that hardly ever gets ridden. A Deity Cryptkeeper and am in the process of ordering a gravel grinder and smaller trail bike. What bike did this replace / What bike were you on before this? Santa Cruz Hightower LT. The Hightower while a great bike had too slack of a seat tube angle and needed a little bit more aggressive geometry to suit me. Did you use Orbea’s custom frame color option? If so, what was your inspiration for the colors you picked? I did. I saw the dark metallic blue in my local shop, Mojo Cycling, and fell in love with it. So I built the color scheme off of that. Did you go for an off-the-shelf build or did you customize the build? Completely custom, the only stock part on the bike is the headset. What’s your favorite part about the bike? The way the bike rides. It can handle being a sled but it is also incredibly playful. What would you change on it? I would add a few more millimeters to the reach. I think around 500mm - 510mm would be a good sweet spot on this bike. How long do you plan on riding this bike? Until the next iteration is released. I've ridden most of its direct competitors and this bike is still my favorite. If you could get another new bike (any kind/type) right now, what would you get? Intense Sniper Trail, I coach NICA so need something to keep up with the kids on their XC rigs. Where do you live? Park City, UT, USA. Favorite local trail to ride? DV, TG, Wasatch Crest. Why did you pick the Orbea Rallon? I work for Orbea so you could say the Rallon chose me! But really I think that this bike felt like home the first time I rode it - it felt 'right' as soon as I hopped on. I test ride a lot of bikes for my job so I know there are a lot of really capable and fun bikes out there (big shout out to my SECOND favorite bike company - Transition!) but I think we nailed it with the ride feel of the Rallon - it feels good at everything to start with and just gets better. Is this Orbea Rallon your only bike? Sometimes, I've gone some years when I only have a Rallon. I love the bike but MOST of the trails where I live are quite fun on a light, short-travel bike. I can pedal the Rallon all day on smooth trails, but why? What bike did this replace / What bike were you on before this? The R4 Rallon - 27" wheels, short chainstays, totally different from this R5. Did you use Orbea’s custom frame color option? If so, what was your inspiration for the colors you picked? Absolutely! How else do you get such a ridiculous Banana Yellow! The color was inspired by the Canyon Senders and Troy Brosnan from the 2017 season I think? Did you go for an off-the-shelf build or did you customize the build? I started with the MLTD and harassed ENVE and ROTOR for the cool bits! What’s your favorite part about the bike? The feel. I feel so centered in it, the suspension is really well balanced for me at this point, it makes me a better rider. What would you change on it? I'd make the reach 5-10mm longer - I am in between the L and XL... the XL feels too big for me, like I have to start a bunnyhop 2 minutes before I get to the log. How long do you plan on riding this bike? Definitely the next two years or longer! We are always working on cool updates but nothing that will make this current bike less relevant - it's too good to need radical changes. If you could get another new bike (any kind/type) right now, what would you get? Transition Sentinel Carbon. Share the stoke of your ride and add your bikes to our Bike Check section. Related: Enduro Orbea Why That Bike? Enduro Orbea Why That Bike?